How to start a sports blog — Ever hoped to start a sports blog? Sports are the great American past time. We play sports, we watch sports, and we talk about it – a lot. Some folks even have the desire to write about sports. One might desire to reach a bigger audience than just family and friends with their views on sports, teams and players. The Internet and blogosphere provide that opportunity. Even if you’re not a formally-trained sports writer, you can gain an audience via your own sports blog. Imagine moving from sharing your sports insights with just your inner circle to having your views read by thousands of people, even millions. And, don’t lose sight of the fact that successful sports blogs can create a revenue stream, and even a significant business, if they attract a big enough audience. But, how do you begin? How do you start a sports blog? The best way to learn how to blog is to start a blog. Learn by doing. I started Sports Feel Good Stories 9 years ago. I wish I would’ve had a guide like this then. Sure, they’re were times when it was frustrating trying to get the site exactly how I wanted it to be (and there still are). But, many more times than that, I’ve been amazed at what can be done with just a few keystrokes because all of the work that’s been done and shared by others. A big thank you to those folks! From free plugins to how-to guides on blogs, the information and resources are available for most anything if you’re not afraid to research, explore and study. The level of sharing and support gives credence to the frequent use of the “blogging community” phrase. 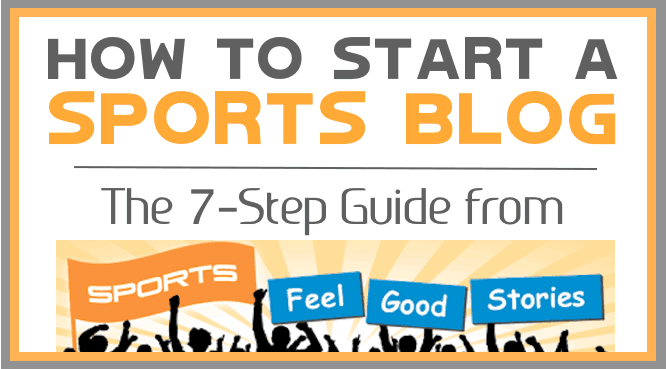 Here’s the Sports Feel Good Stories 7-step beginner’s guide for “How to Start a Sports Blog.” If you’re looking for info on how to start a sports website, you’ve come to the right place. Disclaimer: For some of the partners we recommend in this guide, Sports Feel Good Stories receives an affiliate commission (something you’ll want to look into when you examine ways to monetize your site). All of the products referenced are ones that we’ve used and endorse. Plan your first post and give thought to others. Set up your blog on a hosting service. Install WordPress and decide on theme. Complete the theme’s set-up process and add 2 plugins. Perform some basic optimization of your site. If you’re already set with your blogging plan, here’s a link to enjoy 50% savings on a Bluehost hosting package. If you’re reading this post, you might already have an idea as to what you might write about. If you don’t, start exploring online and see where your interests lie. And, if you’re going to write about something on a regular basis, it’s best if it’s something that you’re inherently interested in. Second best is something you can develop an interest in. It really helps to have a passion for your topic. Much like advice to new writers, write about what you know. If you’re a high school football coach, it’s probably going to be easier to write about high school football than the NFL. Narrow your focus to a topic that you can do justice to. It’s hard to out-NY Times the NY Times. If you’re one person writing, you can’t cover everything in the same fashion that a daily newspaper does. Narrow your focus with smaller circles. Maybe you reduce your focus to one sport, geographically, to one team, to one topic or some specialty that sets you apart from other sites. An author’s first effort shouldn’t be a 26-book set of Encyclopedias. Bite off a manageable chunk that you’re really interested in, but that still has room to grow. When you’ve determined a niche that you really like, complete a competitive assessment. Google and other search engines provide the tool to do that. Do some searches on words that describe your niche and see what other sports sites are out there. Maybe you’ll find someone doing exactly what you were planning for your sports blog. Determine how your sports blog will be different from the competitive set. If you haven’t searched for a URL lately, you should know that it can be very difficult to find the perfect domain name for your sports blog. With a billion websites out there, and more URL’s than that gobbled up, it’s easy to understand why. Many well known names and phrases are gone. For that reason, try to come up with a lot of ideas, and you may need to be flexible. You might not get your first choice for your sports blog. In fact, you might not get one of your top 10 choices. Be creative. Go with a .com name – it’s the standard. Other endings like .net and .us present communication challenges because people are so used to .com names. Avoid dashes/hyphens in your url. Obviousness is good. When people see your domain name, do they understand what the blog is about? How does the URL look written down without spaces like you’ll see it? Sometimes different word combinations create awkward new words or interpretations, e.g. Toms Hitters. Bounce your name off a few people and see what they think. Try to avoid words that have different spellings, e.g., principle and principal to avoid confusion. Is the name memorable? How does it sound? 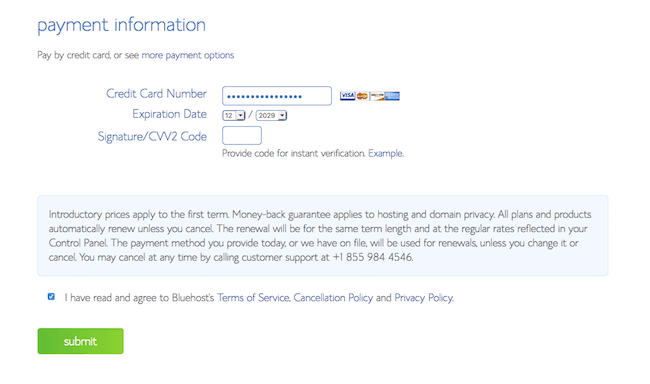 To check to see if your domain names are available, go to Bluehost and enter your options into their new domain checker. It’s a good idea to begin thinking of an editorial calendar. Plan how frequently you’re going to try to post a blog entry. In the early going especially, it helps to have frequent entries as you build up to a critical mass of content and cultivate an audience. The general rule of thumb is that each entry should be a minimum of 300 words. Longer entries are great. But, sometimes you may have exceptions. That’s fine. Also, think about what visuals and videos you might use. Learn how to embed a YouTube video – it’s pretty easy. Do a Google search on it if you don’t know how. Hosting is the rent you pay for the space your sports blog takes up on a server. By setting up your sports blog on a hosting service, you pay a small monthly fee, but you have ownership of your domain and more control over your blog than if you go the “Free” route. Free sites are fine depending on your purpose, but there are some restrictions that limit the growth of your site and the monetizing possibilities. By self hosting, you are able to generate advertising revenue with many different options. Note, we’ll be suggesting you use WordPress.org which can be loaded on to your hosted site free of charge. IMPORTANT: WordPress.org is not to be confused with WordPress.com – which has a free offering. Self hosting is the way to go and there are lots of options. The hosting site that we use on five of our sites, and highly recommend is Bluehost. Because of the number of folks we’re able to send to Bluehost, we’re able to offer 50% off or just $2.95 per month for the basic hosting package. Read all the details at Bluehost. Why Bluehost? Longevity (they’re not going to fold overnight), high level of service, dependability and great prices! Bluehost offers different plans to accommodate various needs. Each package comes with a free domain name. It’s easiest to buy your domain name where you plan on hosting. Otherwise, you have to transfer your domain name to the host site. As a beginning blogger, it’s probably best to go with the Starter Plan at Bluehost, which is the cheapest. 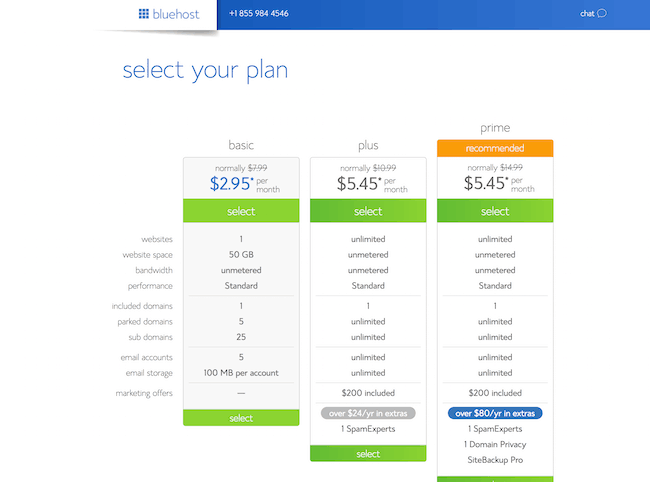 Please note that your price will go up after the first year, but Bluehost’s pricing is still very good. Most importantly, they have excellent service. After extensive research, Sports Feel Good Stories decided on Bluehost when we decided to create a blog. We have 5 different blogs hosted at Bluehost. 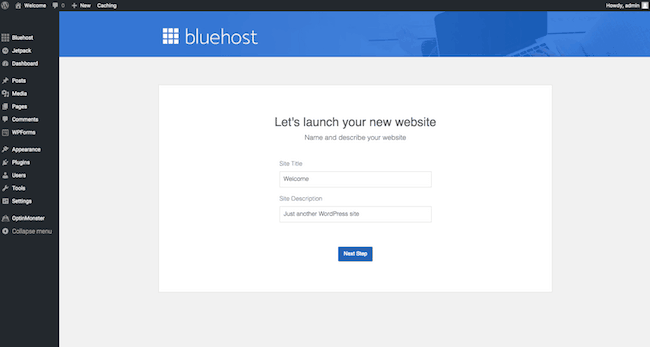 As you’re making your hosting purchase with Bluehost, you’ll encounter this screen. 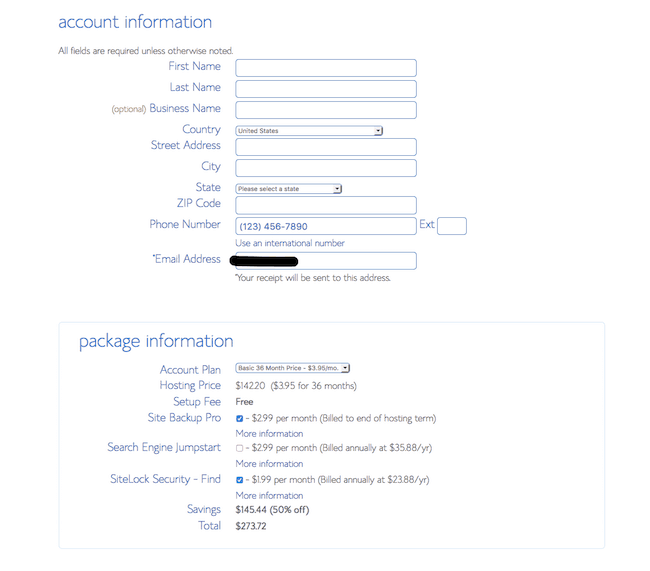 You pay $19.99 per year more if you don’t want your name and number on the domain registry which is published online. I don’t usually pay for this additional convenience, but it’s up to you. You’ll follow Bluehost instructions that are straightforward. Then, choose a Password – make it longer (upper case, lower case and specialty characters), not obvious, but the last 4 digits will be used by Bluehost when you call them – so make the last 4 digits very memorable. What Microsoft Word is to word processing software, WordPress is to blogs. 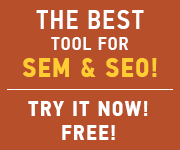 It’s easy to use and it’s great for SEO purposes. 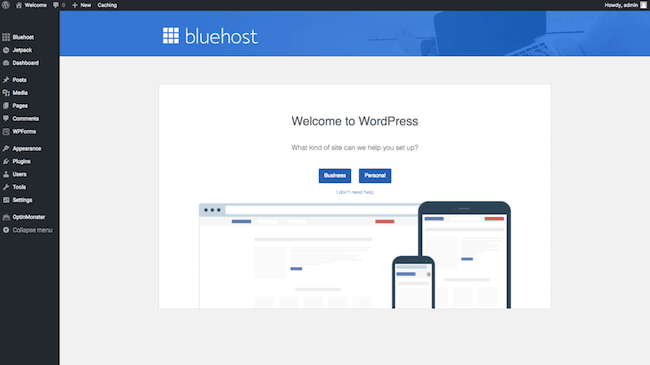 UPDATE: Bluehost has taken the guess work out of installing WordPress. They started the Bluerock experience back in August 2017. Upon creating a new hosting account, WordPress is now automatically installed for the customer by default. After processing, you’ll be given an opportunity to select “Advanced Options.” Do so. Name your site, e.g. Sports Feel Good Stories, and then select your admin username and password for WordPress. Write these down and label them accordingly. Whenever you log into WordPress to access your site, you’ll need these. 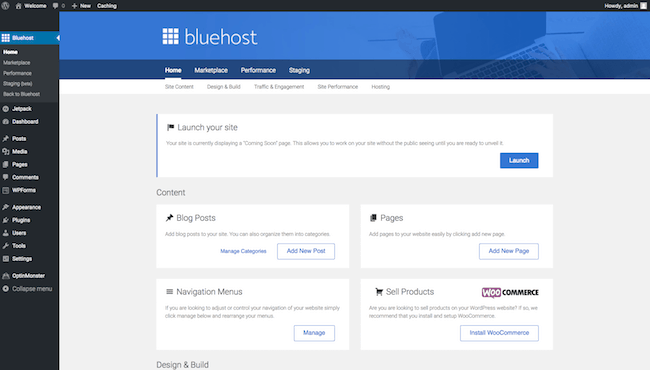 You can pick a Theme from Bluehost’s offerings or select your favorite from all of the options on the Internet. 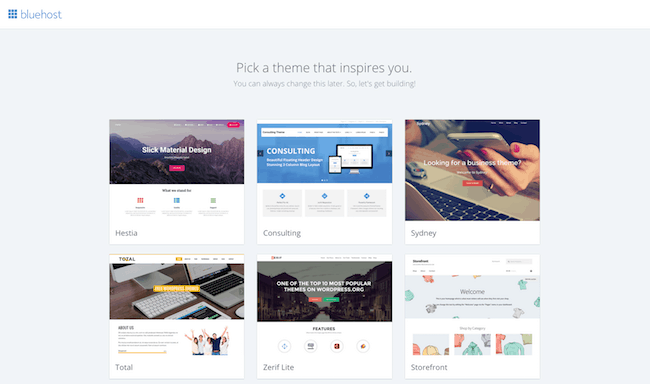 Your theme selection is pretty important as you’ll be spending some time building pages and posts within the selected theme’s structure. Do some research on the types of themes you like, and think thru what you’re trying to accomplish with your blog. With your successful installation, you can now go and log into your site. After your initial set-up, it’s generally easier to go directly to your site and add “/wp-admin” to the tail end of the url, to log in. Go to: www. (your blog name)/wp-admin. Log in with your WordPress username and WordPress password. You’ll go into the WordPress interface for your site. In the upper left hand corner of your page, you should see your site’s name. By placing the mouse over the name, you should see “Visit Site.” Click on “Visit Site” to see what your site looks like at the moment. 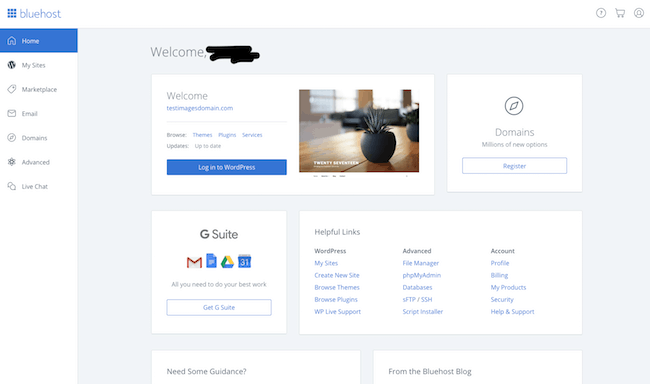 If you haven’t added a Bluehost provided theme, you can add your own. Go to the WordPress Interface dashboard, and down the left side find: Appearance > Themes > and click add new theme. Designers, art directors and programmers work hard to put together solutions that feature broad functionality and look great. Thought goes into typography, location of visuals (above-the-fold or below), etc. Instead of starting from scratch and building up, get a jumpstart with a great theme. WordPress offers some free themes, but we highly recommend the Genesis Framework and StudioPress themes. Sports Feel Good Stories has used the Lifestyle Pro theme in the past. Themes range in price from about $59.95 to $99.95. I consider myself a frugal blogger. But, this was definitely money well spent. 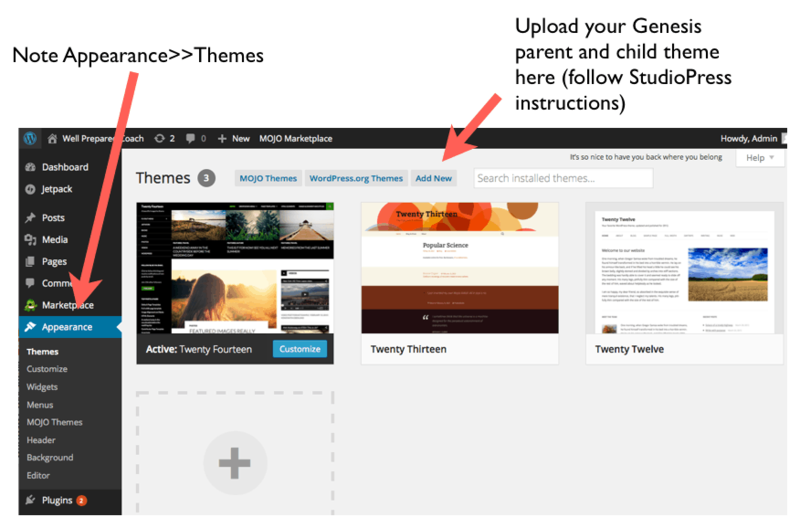 You’ll probably want to get the Genesis Framework parent theme ($59.95) and a child theme of your choice ($59.99 – $99.99). There’s also a package deal where you have access to all of their own themes. Look hard at the different themes from a structure standpoint including number of visuals per page, positioning, size of visuals, etc. What will work best for what you have in mind for your sports blog? When you purchase from StudioPress, you’ll like get both the Genesis (parent theme) and a child theme, e.g., Lifestyle Pro. You’ll upload both of these to your site from the Appearance >> Theme section of the vertical menu on your WordPress control panel. Each StudioPress theme comes with set-up instructions. Here’s one example for LifeStyle Pro Try to follow these very closely. If you run into challenges, use the forum. If you have questions, it’s likely that others have too, and answers have already been documented. And, if that fails, use the Google search engine to try and find answers. And if that fails, submit a ticket and wait for a response. With some patience and critical thinking, getting your theme up and running is very achievable. Remember that for just about every function you’d like for your website to perform, there’s probably a solution for you. The solution might be built into the theme or available via a WordPress plugin. Plugins are usually free of charge. Developers will ask for donations to support their efforts. Let’s say, you don’t want your site to be seen while you’re working on it. The solution: a “maintenance mode” plugin. Go to your plugin section on the WordPress control panel and click on Plugins>>New. Do a search for Maintenance Mode. Review options and select one that you like. Install, activate and go to the settings of the plugin. One potentially tricky thing about plugins: the settings can show up all over the place. Sometimes you can access via the plugin area, while other times they’re only accessible via the verical WordPress menu – frequently under settings (but not always). You’ll have to look around. Another plugin that you’ll want to add right away is a “Contact Us” plugin. Same process, go to Plugins>>New and do a search on “Contact Us.” Before doing that, you might want to do a Google search on “Contact Us” plugins reviews to discover some recommended plugins. This part of creating your sports blog can take some time. When your not making good progress, take a break and then come back to your work. Remember, there’s a lot of folks who have gone through the same issues and challenges. It’s doable. After completing the first 6 steps of “How to Start a Sports Blog,” there are 3 things you should do right away so that your site can be easily found on the Internet. a.) Install the plugin: WordPress SEO by Yoast. It’s free. This is one of the most valuable plugins I’ve come across. When you have a chunk of time, dive into the SEO process early in your blogging venture. It will help you. b.) Fill in your homepage title tag and meta description. It’s free. c.) Register your site with Google, Yahoo and Bing. It’s free. SEO is an ongoing process and there are many books and sites that cover the topic. Don’t underestimate its importance when you start a sports blog. Google folks and the others who run search engines are ultimately trying to make the Internet an effective tool. Over the long haul, remember quality content is what will set your site apart from others. If someone tries to sell you on something that just doesn’t seem right, it probably isn’t. Use your good judgement. Folks like to read websites that have great content, are updated regularly, and that are organized effective. Plan on using your H1 – H6 tags. A general rule of thumb: use one H1 per page and multiple H2s and H3s based on your content topics and length. Don’t force them. See what keywords are driving your competitors’ traffic. Identify great keywords on both a number of searches per month basis and on how difficult it is to compete for a particular keyword basis. The tool also helps you identify problems with your site that are preventing pages from ranking high. 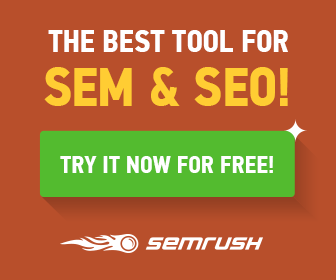 You need a strong tool like SEMRUSH if you’re going to be serious about search engine optimization (SEO). Click on the visual “try it now for free.” Before signing up, I was a little reluctant because of the cash outlay. But, it’s been one of my best investments in my website. Early in the process, gain an understanding of what keywords are all about and how to write a headline that’s interesting and uses keywords effectively. This will help. Your Yoast SEO tool will help tremendously. Over time, you’ll want to optimize your pages and posts as you add them. Using free hosting sites like WordPress.com — If you ever have hopes of selling products and making ad revenue from your site, you’re going to want to own your site. You can do that with WordPress.org (note the .org). Choosing too broad of a subject matter — Better to select a niche and serve it well than to try to cover all sports all of the time. Spending too little time on crafting your post headlines — One of the most important things about your post is your headline. Spend time and get it right. Consider your headline’s attention grabbing potential, consider the SEO ramifications and choose wisely. “How to Start a Sports Blog” was chosen over “How to Start a Sports Website” because more people search for How to Start a Sports Blog. Not letting your personality shine — Finding your voice is important in writing. Don’t try to be someone you’re not. Open up to your readers where you can. Trying to design your own logo — Sometimes things are better left to professionals. Logo designs are one of them. Spend a few dollars and make it respectable. Not studying search engine optimization — Don’t reinvent the wheel. Learn what works and what doesn’t. SEO is key in building an audience. Not being opportunistic — Look for ways to stand out from the crowd on content, partnerships, approach, graphics, etc. So, there you have it: How to Start a Sports Blog. You now have your blank slate. Go forth and write. Build an audience. Tell it like it is. Start a sports blog with style. Start a sports blog that lasts. Make a difference! 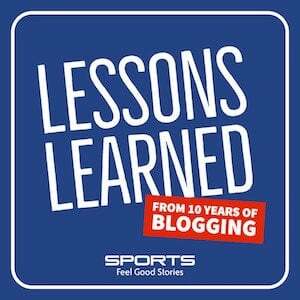 If you go through this process of “How to Start a Sports Blog,” we’d love to hear from you. If you have any suggestions for improving “How to Start a Sports Blog,” please let us know. Thanks. Check out “Lessons Learned from 10 Years of Blogging.” This is a great feature for both folks consider whether to start publishing a site or for those who are current publishers. –Mike O’Halloran, founder of Sports Feel Good Stories. Check out the Sports Feel Good Stories Store for offseason workout plans for baseball, basketball, football, softball and fitness, coaching plans for baseball, basketball, soccer and softball and award certificate makers.